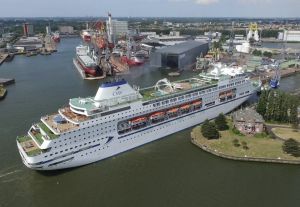 Cruise and Maritime Voyages (CMV) welcomed its new flagship Columbus into the fleet just four weeks ago with a glittering naming ceremony at the London Cruise Terminal, Tilbury. The 64,000-tonne ship can carry up to 1,400 people and is based at the Essex port, close by the London orbital road, the M25. In airline jargon, it is a no-frills terminal, very easy with the drop-off, and quickly on to the ship. See also ON TOUR in this issue. The cruise industry saw nearly 1.9m people sail from a UK port last year and now, with the arrival of Columbus, a new cruise ship for Britain, this is set to grow even further. This report is not so much a review but a report on what Columbus offers. The maiden voyage took in Amsterdam and Antwerp, just three nights. Certain facilities were not available, which gives an excuse for trying the ship again when everything is up and running. The two swimming pools were not functioning nor the hot tubs, and while breakfast in bed was offered (cold plus hot beverages), the advertised courtesy room service did not materialise. This suggests a variety of sandwiches, beefburgers and other simple meals, plus a good selection of (chargeable) wines and drinks. There are two laundrettes on board and a laundry and pressing service. Once sailing as Ocean Village, Columbus is particularly well laid out, offering acres of sun deck and two decent size swimming pools, with most of the daytime activities, including a large outdoor screen, high up on deck 12. 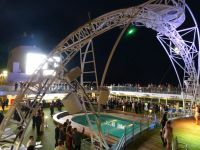 Deck 7 contains both the spacious Waterfront restaurant and the Palladium Show Lounge with its retractable podium stage. In between, amidships, are two of the most popular evening venues, the Taverner’s Pub and the Connexions Lounge, a more relaxed offering; for the most part a jazz pianist in one and a fine light trio in the other. 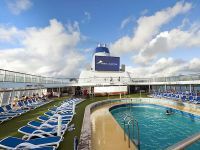 Entertainment on Columbus has been upgraded from CMV’s last "new" ship, Magellan (see Cruise News August 2016, with an eight-strong lively singing and dancing troupe who certainly worked hard with three shows on some days, plus deck entertainment. The Palladium Show Lounge is spread over two decks, holds about 500 people and is nicely raked. It has a comfortable feel about it. Godmother to Columbus was TV personality Angela Rippon CBE, who named the ship. The local brass brand and traditional water cannons saw the ship off. Columbus has essentially four grades of cabins. Each has plenty of storage space, a fridge, hair dryer and safe. Most can be set up with two single beds or a double bed and have extra temporary beds. The accommodation for handicapped clients is spacious and well laid out, but there are limited number of cabins. Not so for single travellers, with 150 single rooms available. Smoking is forbidden inside the ship, but there are allocated areas on deck 12. The Junior Suites (372sq ft) have a balcony, wide-screen TVs, baths with shower, trouser press, a complimentary bottle of wine plus daily fresh fruit. We were told when the tenders are used priority disembarkation is offered. The smaller Premium De Luxe units (253sq ft) are similarly furnished. Like all the cabins on board, the dark wood surround does make them feel old fashioned, but nothing wrong with that. All 64 top cabins are on deck 11 forward. All have full self-service minibars with honesty slips to sign. For all other cabin categories, you have to phone for service via your steward. On deck 11, the one-time children’s area in the stern is now called Trumps and Aces, a quiet lounge for coffee table activities, plus the ship’s library. The balance of the cabins are all the same size (188sq ft) whether a large picture window, porthole, or inside. They are priced depending on location and offer similar amenities, and ample floor space. One department that was working well was the wi-fi lounge in a quiet area adjoining the Palladium lounge balcony. Seven 27in HP all-in-one computers were supplied, with no discernible lack of speed compared with land-based systems. When it comes to the culinary aspects of the ship, Columbus has the greatest choice yet offered by CMV, starting with the Chef's Table, nightly fine dining for just 14 partakers at £49 per person including paired wine for each course. Also bookable is The Grill with 64 seats (£25), an exclusive offering by the Well Hung Meat Company. For those craving an Indian meal, Columbus offers Fusion by Chef Michael Shaji (86 covers) at £15. The main Waterfront Restaurant seats 812, is spacious and a two-seating experience. You can easily turn your eating into a five-course offering including a choice of cheeses plus coffee and tea at the end. Pre-ordered special meals are available at no extra cost and if you do not like the choice (and there is plenty), always on offer is grilled chicken breast and salmon. The traditional English breakfast is served with a daily change of the speciality course. Up on deck 12, the self-service Plantation Bistro offers the same main courses plus a very good selection of cold dishes and salads plus deserts. Waiter service is available for those who need assistance and the bar staff are always ready for your order. Coffee and tea are available from very early until very late. Late-night snacks are served all around the ship from 23:00 until midnight. BTN will review the dining another time. On deck 5, Hemmingway’s serves speciality coffees and cakes (extra), and here you have the casino and Captains Club. All are part of the Atrium, which spans three decks including the Raffles lounge on 5, and the shopping galleria on 6 and 7. All the bars serve a cocktail of the day, typically Banana Mana (£3.10) consisting of rum, Malibu, orange, pineapple and banana juice. Very thirst quenching. Beers start at £2.50. 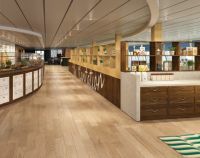 Also on deck 12, around the two pools, is the Alfresco Grill for quick lunches, cappuccinos, a coffee shop and bar, and Gelato’s is an ice cream shop. The latter two are chargeable, as is the Oval Pool Bar. The screen shows live sporting events and offers a film programme. Up on deck 14, overlooking the bow and above the bridge, is the Dome Observatory and Nightclub. It is a fine lookout position during the day and far enough away from the cabins not to disturb anyone with the late-night discos. Deep down in the ship (deck 2) is the Jade Wellness Centre, with a small gym, hot tub, spa, hair and beauty salon and thermal suites. For some, the maiden voyage was just the start of a longer holiday, with passengers booking back-to-back cruises with the ship off to the Norwegian fjords on its return to Tilbury. This summer, Columbus has an interesting itinerary with cruises from three to 15 days taking in the British Isles, Iceland, Baltic Cities, Canary Islands and Madeira, Scottish Highlights and Faroes, Spain, Portugal, France and Gibraltar, and on 5 January a spectacular 121-night voyage to Auckland, New Zealand, passing through the Suez Canal in both directions.